"Much like an actual cat, this book manages to be funny, weird, and lovably adorable all at the same time. You will love Pusheen and you will love this book." "Pusheen is what everyone else wishes they had come up with after the internet was invented. It is also possibly the reason the internet was invented in the first place. Now that it's a book, I fully expect it to resurrect the print industry as a whole." "Pusheen is easily the most charming of all internet cats!" "I thought I was tired of cat gifs until I discovered Pusheen." "Pusheen is a little bouncy marshmallow of a cat who perfectly combines absolute cuteness and absolute trouble, which is, as all cat lovers know, why we love them." 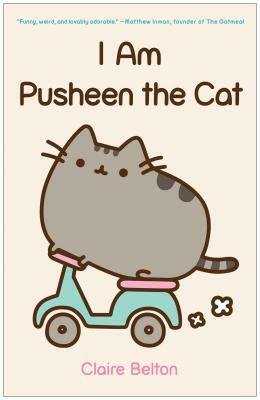 "When it comes to famous Internet cats, Pusheen rules the litter box. The cute plump feline is Tumblr's premier kitty. With clean and simple shapes, Claire Belton's cartoon is a mix of Hello Kitty's cuteness and Felix the Cat's adventurous spirit." "Pusheen teaches us how to LIVE: Nap as hard as you party. Seek out the small joys in life, and eat them. Eat everything. And keep moving." "Pusheen is the most adorable, squishy little nugget of felinity that has ever graced the fair pages of my Internet browser. I want to eat her, like a tiny grey cute-flavoured marshmallow."